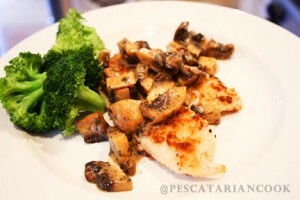 This recipe is for a light and flaky tilapia dish that is topped with a hearty and creamy mushroom Marsala wine sauce. Tilapia is a farmed raised fish and is one of those fish you want to purchase with a bit of prior information. My husband is from Ecuador so we always purchase tilapia that is farm raised in Ecuador, and they have some of the best practices in tilapia farming. My recommendation is that you always avoid tilapia farm raised in China. The Monterey Bay Aquarium has a some great information about farm raised tilapia. I like to prepare tilapia during the week because if you freeze portions of tilapia filets they thaw and cook quickly. I usually purchase fresh tilapia filets and then portion out two filets per freezer bag and freeze them so they are ready to go for a quick any midweek meal. 1. First rinse the tilapia filets under cold water. Blot the excess water with a paper towel and season both sides with sea salt and fresh ground pepper. Then, press your filets in panko bread crumbs so that you coat each side evenly. I do this by pouring the panko bread crumbs onto a baking sheet and then lightly pressing the filets on each side into the crumbs so that they stick nicely to the filets. 2. Let these breaded filets sit while you cut the mushrooms into large chunky slices. Set them aside and gather the other ingredients for your sauce so you can make this quick pan sauce after sauteing the fish. I micro-grate the garlic and have it ready to toss in the pan, portion out the Marsala wine, pour the cream into the measuring cup, and set aside the right amount parsley. 3. In a non-stick skillet; I prefer cast-iron, heat about 2 Tbs of olive oil on medium high heat. When the oil is hot and moves quickly in the pan toss in your panko dusted tilapia filets. Cook the filets on each side for about 4 minutes. The filets are ready when the fish flakes easily with a fork. Remove the filets and set aside. 4. Now you will make this easy pan sauce. Do not worry if there are extra crumbs in your pan as they will just incorporate into your sauce. Remain cooking on medium high heat. If you need a bit more oil go ahead and add a little olive oil to the pan. Then toss in your sliced mushroom and caramelize by stirring them around in your pan. You will want to hear them sizzle a bit to ensure that you are getting a good caramelizing. I cook for about 1-2 minute or so add a bit of salt and pepper and then stir in the minced garlic. You will want to quickly toss in the Marsala wine after adding the garlic to ensure that the garlic does not burn. Stir the pan to help the wine deglaze the pan and let it reduce a little over 1/2 of the original liquid level. Toss in the parsley and stir and then reduce the heat and add the cream and stir to incorporate. Turn of the heat to ensure that the cream does not break and separate. Pour all this goodness over your Panko crusted tilapia and enjoy!